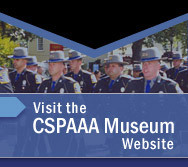 The Connecticut State Police Academy Alumni Association provides an online calendar of upcoming CSPAAA sponsored events and activities as well as upcoming state police events and activities. Because some event items listed may be subject to change, please contact the CSPAAA for further information. To search for upcoming events, simply click on a date in the calendar to the right or select a search range from the criteria below. View all items by selected (Month) (Year). There was nothing listed in the Online Calendar for the specified date range. Feel free to select a different date by using the calendar navigation system above.